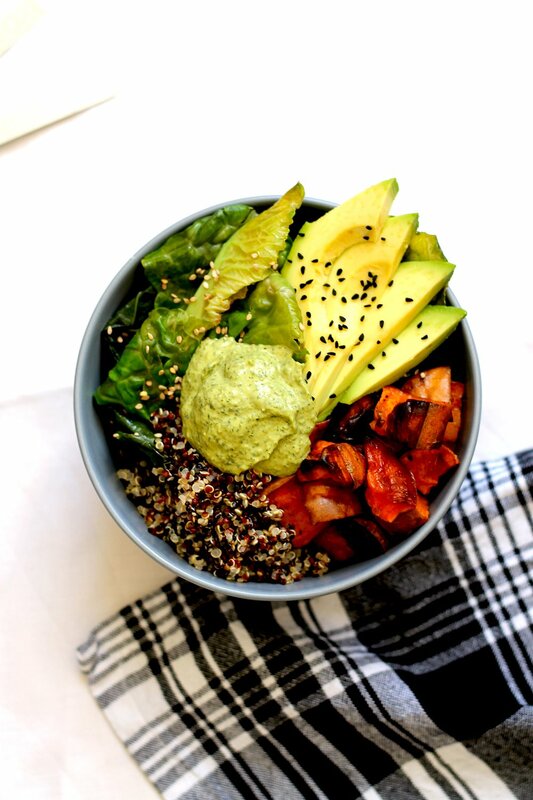 I've tried quite a few variations of the ol' grain + greens + veg + sauce combo, and this quinoa & sweet potato vegan buddha bowl is simply the best! Pre-heat the oven to 200°C (gas mark 7). Place the diced sweet potato in a big bowl. Add 1 tbsp olive oil and a good pinch of salt and mix until each piece is well covered. Transfer to a baking tray and bake for 45min or until brown and slightly crispy. Season with more salt if necessary. Make the green tahini sauce by blending all the necessary ingredients with a hand-held blender or food processor. Season to taste with salt & pepper. If the sauce is too thick to blend properly, add a few tbsp of cold water. In a large frying pan or wok set onto medium-high heat, heat up 1 tsp olive oil. Add the chopped garlic and cook until slightly golden. Add the sesame seeds & spring greens, season with salt & pepper and cook until wilted. Arrange the cooked quinoa, wilted greens, baked sweet potato and chopped avocado into a large bowl. Top with a generous spoonful of the green tahini sauce and serve right away.